Napavine celebrates the life of Martin Luther King Jr.
Jillian Fuss in front of the sign of responses. Martin Luther King Jr. Day was celebrated on January 21. The Napavine ASB wanted to celebrate and honor the life of the famous civil rights activist. On January 16, students and staff were asked how they wanted to follow Martin Luther King Jr.'s footsteps and what they can do. 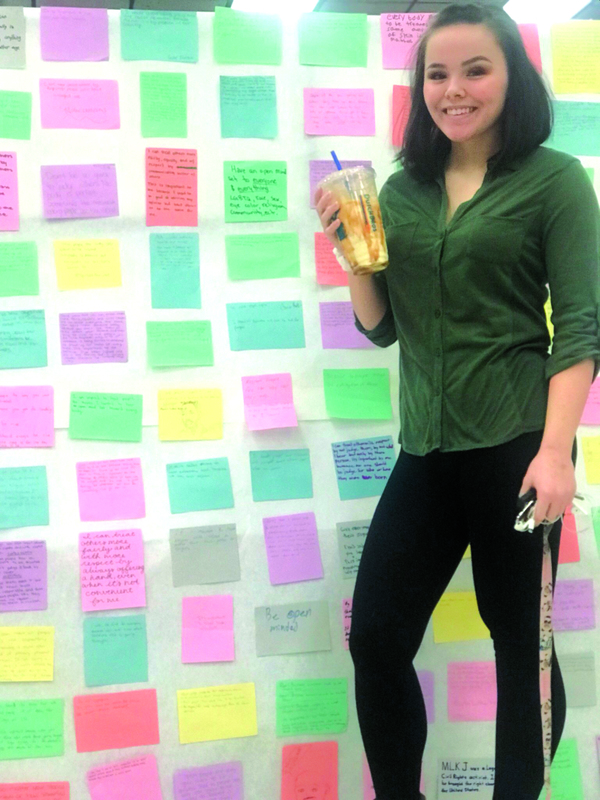 Each member wrote down their responses, which was hung on a sign in the commons of the school. "Martin Luther King represented everything that was great about America. A man of the people who fought to protect the rights of all Americans- he did this non-violently with love and with the desires to serve other people before himself," one submission stated. Ada Williams, a Napavine senior and ASB president, hosted an assembly to honor the life of the activist. Conner Hogue, the weights teacher and ASB advisor, aided his members in setting up the assembly. A projector rested in the middle of the gymnasium floor and both middle school and high school students gathered to watch. The famous "I Have a Dream" speech was projected onto the screen, afterwards the ASB team recited his famous quotes and the history of his life. "We might be excited to have this following Monday off, but remember the true meaning of this day," Conner Hogue announced. Hogue brought the assembly to a closing with one last reminder for students to be kind. "I ask you to do something kind for someone, not for likes on social media or the benefit of yourself. Do something kind to help another person," he stated. The Napavine staff and students would like to honor the life of Martin Luther King Jr., may his activism and contributions be remembered.